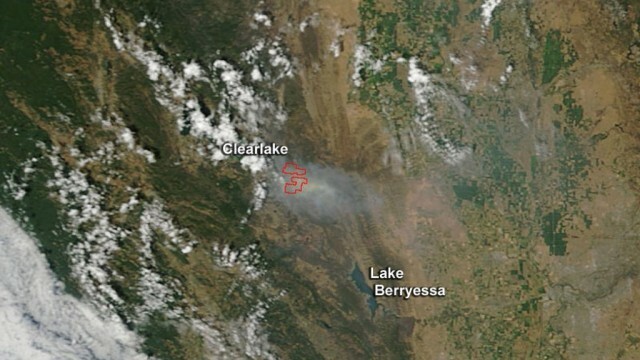 The Rocky Fire as seen from space. Photo courtesy of NASA. Firefighters and equipment from Los Angeles and Orange County fire departments were in northern California Saturday helping to battle 18 wildfires that are plaguing areas left tinder dry due to drought conditions. Various Southern California fire departments have been deployed on mutual aid assignments up north, including helping to battle lightning-sparked fires in Six Rivers National Forest and the Rocky Fire, where 22,500 acres have been burned with only 5 percent containment as of Saturday evening. One firefighter has been killed. David Ruhl of Rapid City, South Dakota, went missing Thursday while battling a wildfire in the Modoc National Forest about 100 miles south of Oregon. 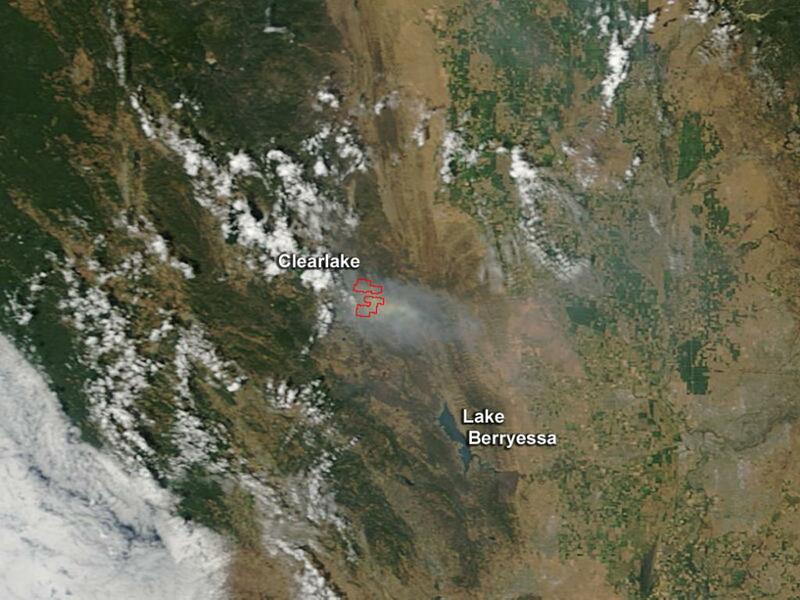 That fire has burned at least 800 acres. Ruhl, a U.S. Forest Service firefighter, was driving down a road in a vehicle by himself, scouting the area when the then-small fire suddenly expanded, U.S. Forest Information Officer Ken Sandusky said. Crews fighting the blaze lost communication with him Thursday evening. His body was recovered on Friday, according to Sandusky. The news of Ruhl’s death came just hours after Gov. Jerry Brown declared a state of emergency requiring all state agencies to provide assistance if needed to respond to the fires. Brown also mobilized the California National Guard to help with disaster response.